If it wasn’t cool enough that EZAir Wireless has taken over the United States and Asia– now they are ready to debut in Europe, too! However, what’s even cooler is the fact is that we are all getting used to (and loving) the hassle-free environment made possible by Wireless USB capabilities from EZAir. Whether using the EZView, EZView+ or the EZDock, consumers are bound to be taken by the ease, convenience and quality of these products. The EZView offers a wireless connection between one’s personal computer and television for both the video and the audio components. This USB tuner boasts up to 1400X1050, 720p full HD video resolution. The purchasing price rings in at about $149.00. The EZView+ is very similar to the EZView, except that it connects one’s notebook to their television, and it costs $189.00. The EZDock, on the other hand, wirelessly connects one’s laptop to a mouse, keyboard, monitor and speakers. It is Mac compatible, and has up to 1080p HD video resolution. This convenience comes at a cost of $159.00. 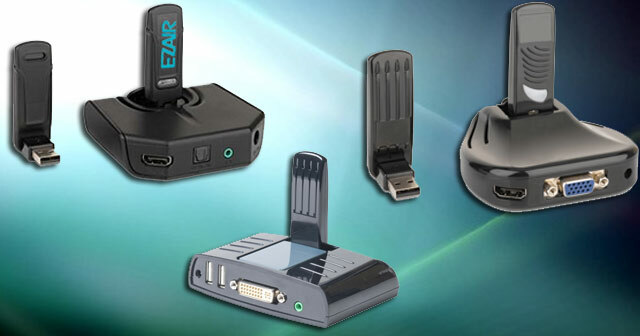 All of these particular EZAir Wireless USB products offer plug and play capabilities. These entertainment tools work by using Wisair’s Ultra Wideband Wireless USB technology. The two EZView’s allow you to stream everything from your computer screen to the television set or projector. They offer secure communication environments, which not only enhances their reliability but also your peace of mind. Additionally, they work by utilizing a USB to HDMI adapter system. There is a PC adapter (a small dongle) which plugs into the computer’s USB port. Then an adapter connects directly to the television (or projector) via an HDMI cable. Once everything is plugged in correctly, the data between the television and the computer should be synchronized. There is no big secret as to why EZAir Wireless’s USB tuners are growing more popular at home and abroad–we can connect more of our home entertainment wirelessly, making it easier to share with the rest of our households. Do you find the need to connect your PC to your TV? Does EZAir Wireless offer the function that you’re looking for? Weigh in! This entry was posted in Articles, EZAir, USB Devices, USB Future, USB Gadgets, USB Tuner, Wireless USB Technology and tagged EZAir Wireless, EZAir Wireless PC to TV Solution, EZAir Wireless USB capabilities, EZDock, EZView, Wireless USB. Bookmark the permalink.